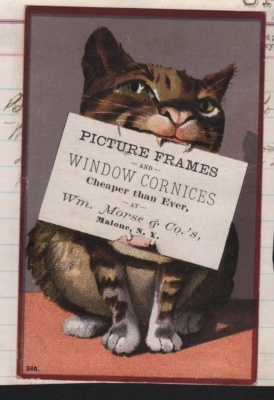 One of the most popular forms of advertising for small businesses at the turn of the century were trade cards (small space ads). 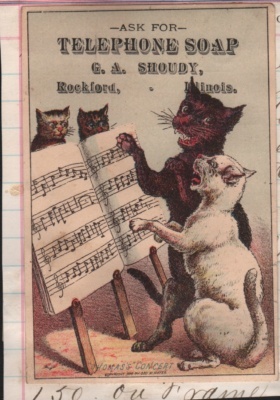 They were about half the size of today’s postcard. 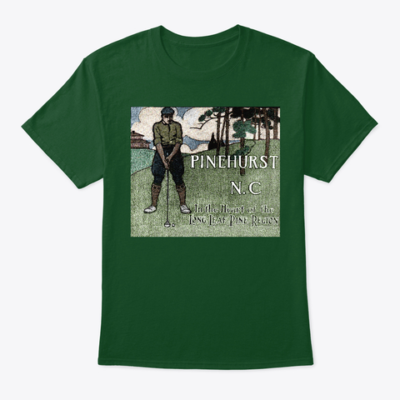 And they were typically a pre-printed color image on the front. The local businesses would print their own message on the blank reverse side. 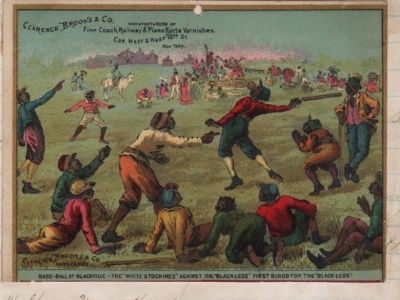 During this period, color lithography was becoming more affordable. 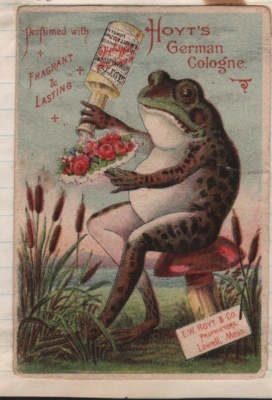 Manufacturers embellished their cards with decorative graphics, usually flowers, cherubs and scenic landscape. But cartoons were also very common. 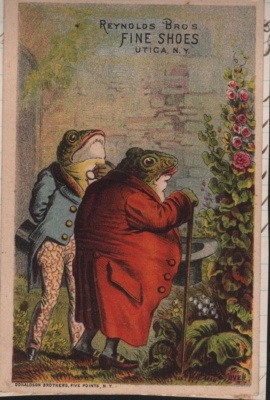 Collecting trade cards was a popular pastime. Many examples have been passed down in family scrapbooks. We found these examples in some scrapbooks. 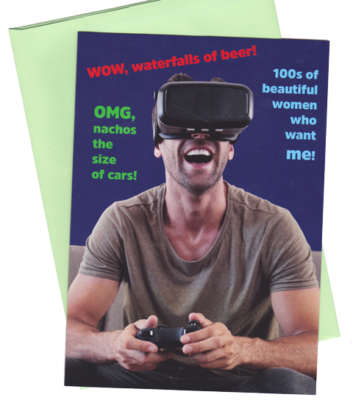 Card for a cusomized message. 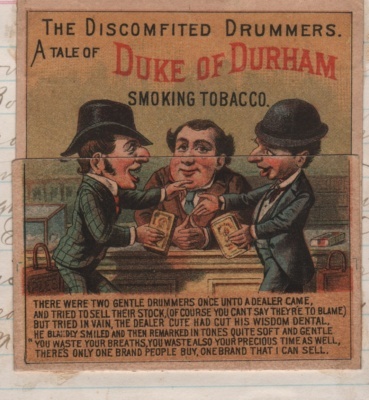 A trade card novelty that unfolds to reveal the rest of tobacco sellers message. 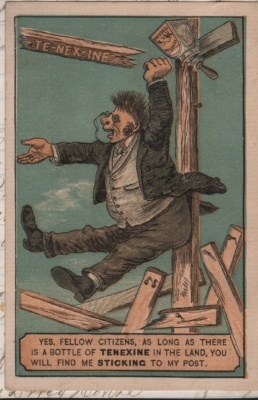 Card for a varnish maker featuring racial stereotypes from the 1880s. 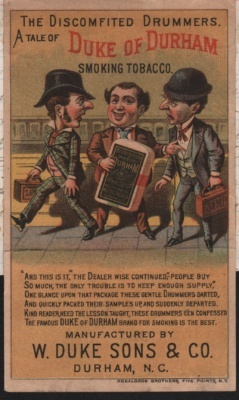 Here are some interesting examples of trade cards that were popular in the late 1800s. 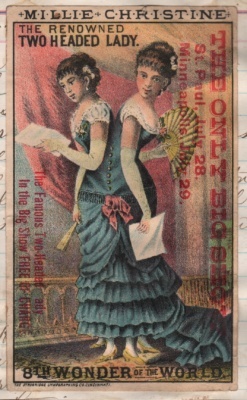 The idea of advertisers was to attract the customer with a razzle-dazzle color visual on the front and leave the hard sell on the reverse side. 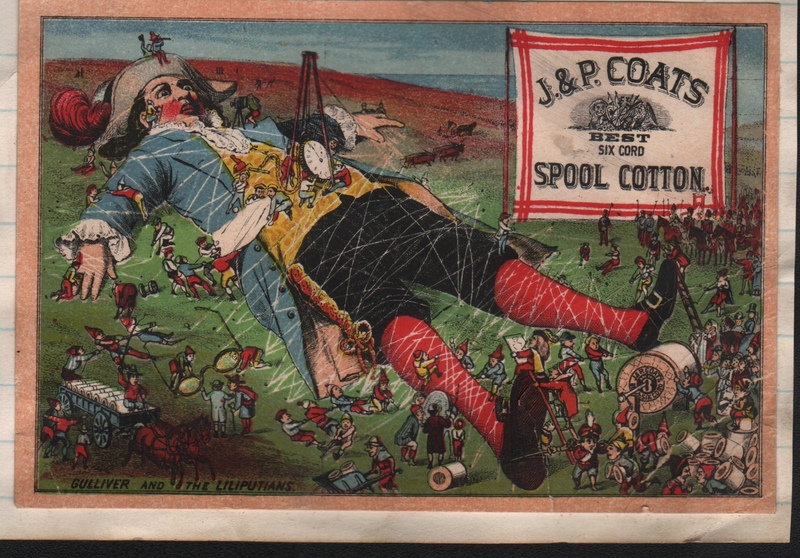 Manufacturers of spool thread loved to brag about the strength of their product. 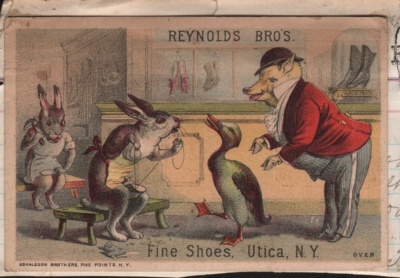 A four-part story for Acme Soap (Yes, 60 years before Wiley Coyote!) 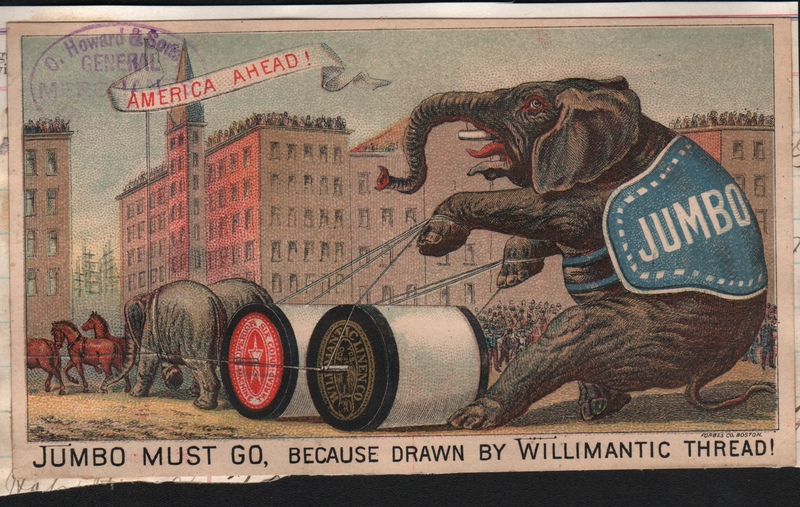 Here, little Willie is saved from drowning in the well by the soap’s amazing foaming action. 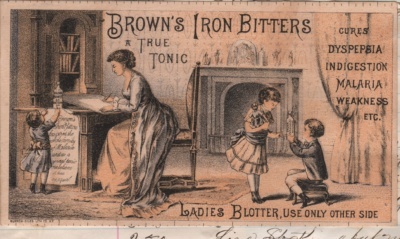 A trade card for a tonic medicine that also doubled as a blotter on the other side for letter-writing. Whenever used, the product name was front and center. Sometimes the visuals had very little to do with the product and were eye candy for shoppers. 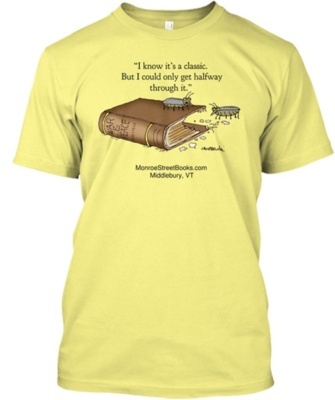 Many collected them and kept bulging scrapbooks of their favorites. 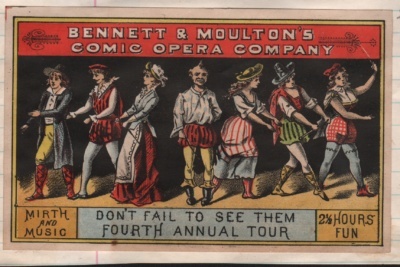 Traveling circuses and vaudeville shows distributed cards with local businesses ahead of their arrival.